Over the next four years I made the 21.1k my goal. From cycling injuries, rock climbing injuries, running injuries, and even injuries from vacuuming (yes I’m that clumsy), I missed my chance every year and wondered when or if I would ever make it. I’ve even signed up one year and then got injured and had to sell my bib. It was frustrating knowing that mentally I felt like I could do it but my body couldn’t physically keep up. 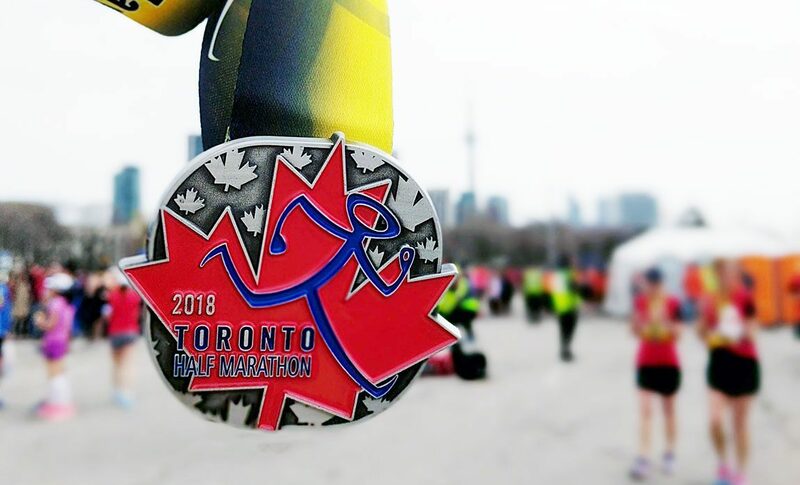 This year I decided to sign up for the (Goodlife) Toronto Marathon in May to hopefully avoid injuries (which usually happens in the summer), and I usually have no issues training through the winter anyway. I’m so thankful to have stayed comparatively injury free this year; I started getting some knee pain in April which mostly went away near the end with rest, and also started developing some difficulty breathing near the end of April either due to distance running, allergies/air quality or maybe asthma (still not sure 😪). The knee pain really set me back on my training plan but I decreased mileage to manage the injury which was definitely the right choice. I surprisingly managed to get one slow 20k practice run in which gave me much more confidence going into the race. 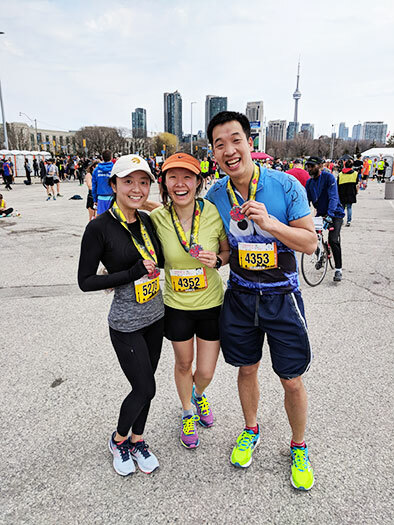 My hubby K decided to join me in doing the half (his first as well), but didn’t end up training much – he only ran a 10k and 4k leading up to the race but with his intense cycling I was sure he had the cardio to pull it off. 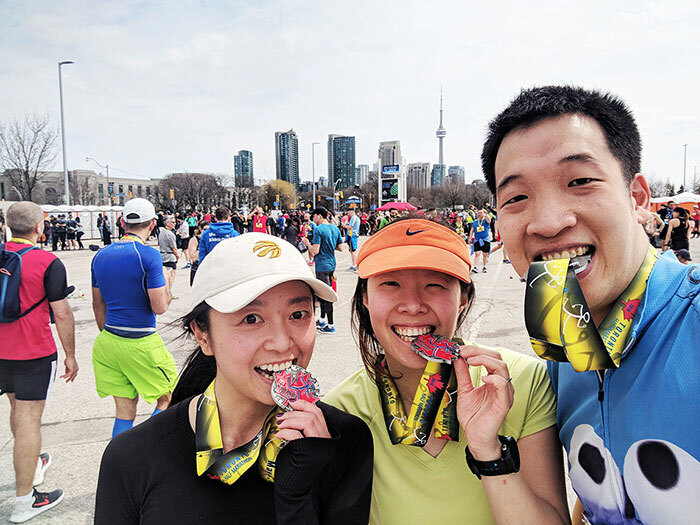 0km – 11km: The first 3km were easy, confident and relaxed heading down Yonge, and I tried to keep hubby, Emma and the 2:00 pace bunny in sight while going at my own pace. I totally forgot that we would have to run up the dreaded hill on Yonge south of York Mills – you can see the crowds of runners making their way to the top from afar. Thankfully my mental game was still strong as it was still early in the race and I didn’t even have to stop until the top, where everyone was fighting for water at the station 😝. The rolling hills after that were pretty easy comparatively and I knew what to expect since it was the same route as the Sporting Life 10k. 11-15km: We turned off Yonge onto Rosedale Valley/Bayview and this stretch was pretty boring with no water stations at all. It was a quiet, forested area and all you can hear is the pounding of feet. I had to fight so hard not to drift into boredom and tried to stay focused. I saw someone holding a sign that said “She believed she could so she did” and channeled some @mrswooruns to get through that stretch :). Up to this point K and I had been casually passing each other but I lost sight of him as he went ahead after we turned onto Bayview. 15km – 18km: The route through the downtown core was a very familiar one since I run it all the time from the office. Sometimes being familiar with the route is even worse since you know exactly how much farther you need to go, so I tried to break it out into smaller chunks (like “just get to the office next”). During the race and especially at this point I kept telling myself that YES I could do this, that all my training has prepared me for this, and after all these years this was the race God has prepared for me and I need to give it my all! I hit 16km at 1:32 and thought I may actually get a chance to make it to the end just under 2 hours so I upped my pace just a little. I’ve learnt that calculation skills are subpar while running and I should have known that I wouldn’t be able to keep up that pace especially at the end of a race 😛. 18km – 21.1km: I started to lose focus around the 18km mark as we turned onto Front St because I knew we were nearing the end. That feeling of “so close yet so far” gets me at every race and it’s something I really need to work on. I also think I picked up the pace a bit too early and was burning out fast (stick to the plan next time!). Thankfully I finally caught a glimpse of K right when I needed it around 20k and and slowly caught up to him. When I got close I reached my arm out to him and mouthed “helpppp” hoping he would turn around 🤣🤣. It was such a struggle mentally at that point also because I thought the finish line was 1km closer (where Sporting Life usually ends) than it actually was. It was exhausting and disheartening when I made so many turns and still couldn’t see the finish line. K was also struggling at that point with his knees starting to give out and we were barely about to keep up with each other. At one point I was telling him that I couldn’t do it, and then 2 mins later he was telling me he couldn’t keep going – I think we stayed motivated by just being near each other. So thankful for his encouragement at the last stretch even though I know he could barely breathe – all I could do was nod and just make sure my legs kept moving. 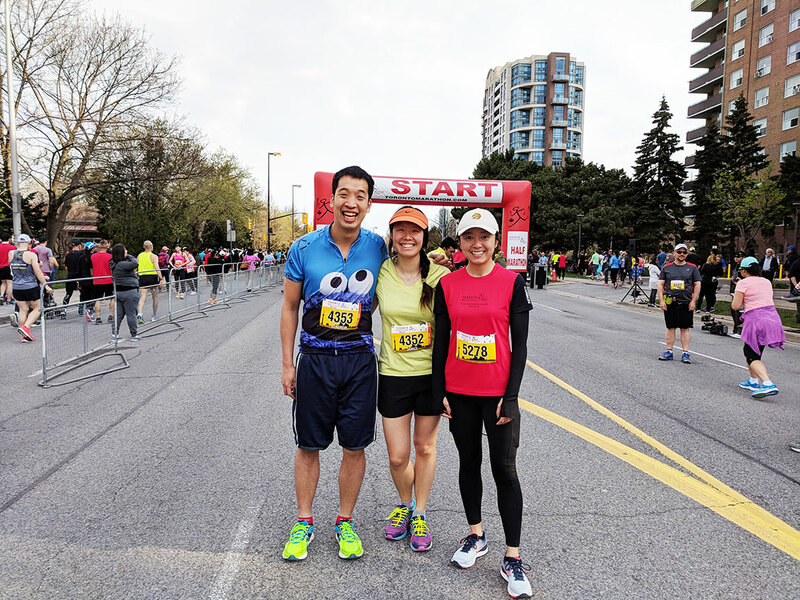 We were able to cross the finish line together hand in hand with smiles and relief :’) We honestly never planned to finish together; hubby thought I would finish ahead of him because of my training and I said I wouldn’t wait for him if I was ahead 🤷 LOL! But what an extra blessing that we could accomplish this together! We completed the half in 2:03:43!!! I expected to finish around 2:30 because of the health concerns, maybe 2:15 if I’m lucky, but 2:03?! Deep down I wanted to try for 2 hours but I really didn’t think it was possible. The perfect weather and downhill course definitely helped, but most of all the training paid off. I’m so thankful for this opportunity to be able to run and finally achieve my goal; truly with discipline and dedication anything is possible and our bodies are capable of so much. I loved the physical and mental challenge of this distance and being able to overcome that. I’ve learned so much in the process and during the race, and I can’t wait to keep improving. Here’s to more races and crushing more goals!! !